The rivalry came as a surprise to everyone when it began in November of 1972. 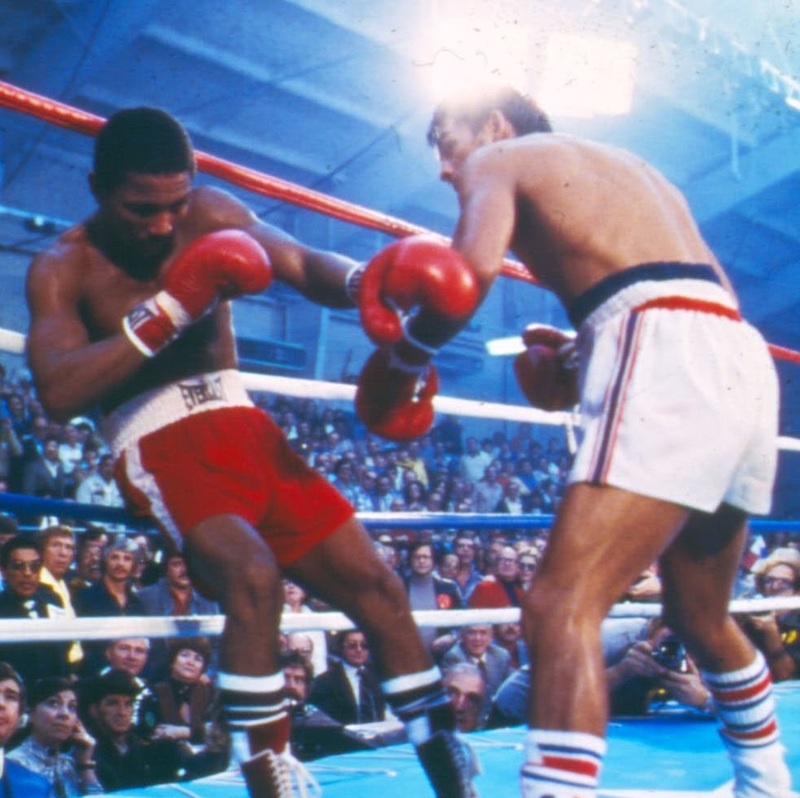 A surprise because, at the time, no one expected the fistic dynamo that was Roberto Duran to suffer defeat to anyone, let alone a mere “tune-up” opponent. 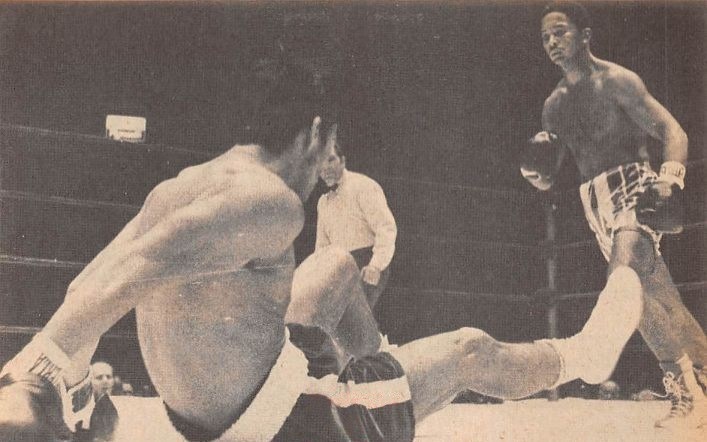 Just five months after establishing himself as the best lightweight in the world with a one-sided battering of Ken Buchanan, the man they called “Manos de Piedra” faced Esteban De Jesus of Puerto Rico in a non-title match in Madison Square Garden. 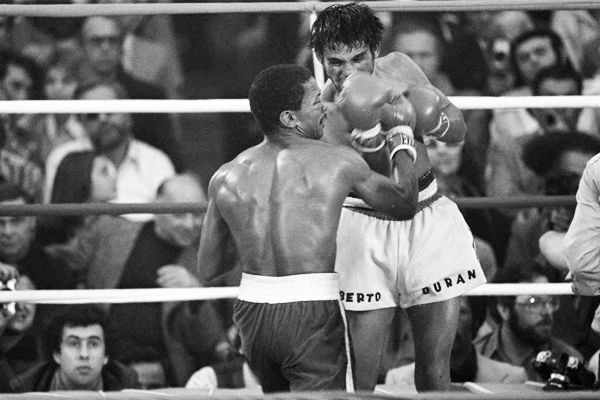 It was in fact Duran’s third non-title fight since becoming champion, the other two easy first round knockouts. This was to be another quick payday and a chance to show off Roberto’s prodigious talents to a New York City fight crowd. But, as everyone quickly learned, Esteban De Jesus was no one’s tune-up opponent and he wasn’t about to be just another easy knockout on Duran’s record. 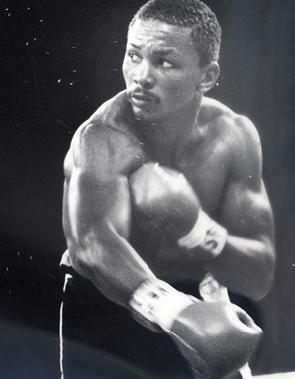 Clever and crafty and with a dangerous left hook, he would go on to prove himself one of the best lightweights of the decade and one of the finest boxers to ever emerge from Puerto Rico. He floored Duran with a hard left hook in the opening seconds of the match and, to the delight of his fans, went on to take a clear points win. 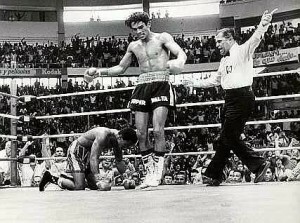 His compatriots celebrated as if Duran’s title had been at stake, lifting De Jesus on their shoulders after the decision was announced and parading him through the stands of the venerable Garden. Esteban puts Duran on the canvas. 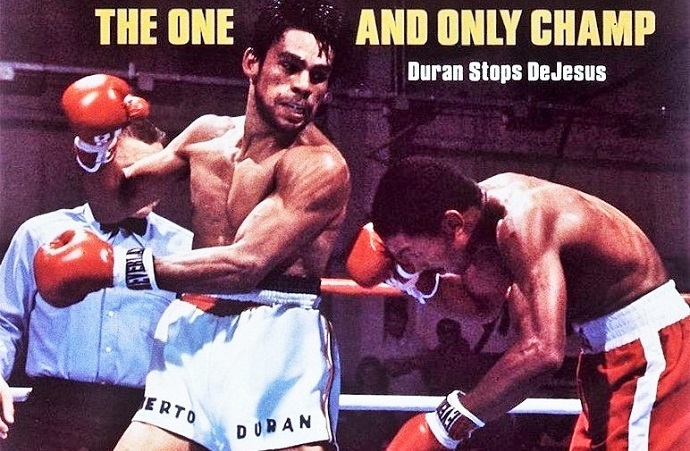 De Jesus and Duran went their separate ways, Roberto insisting the first defeat of his career was an aberration, the result of his being ill-prepared, and both embarked on impressive win streaks. Esteban notched seven victories in 1973; Duran scored ten, including three successful defenses of the championship. 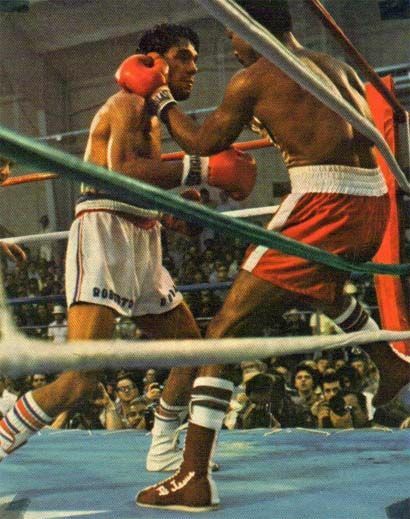 Now it was time for a rematch and Duran’s chance at revenge with the crowd cheering for “Manos de Piedra,” not De Jesus, as the second fight took place in Roberto’s home town of Panama City. And this time Duran’s WBA belt was on the line. Duran stands over De Jesus in the rematch. Duran ignored Arcel’s advice in the opening round and paid for it by being floored again courtesy of a De Jesus left hook, but after that Roberto boxed with controlled fury. 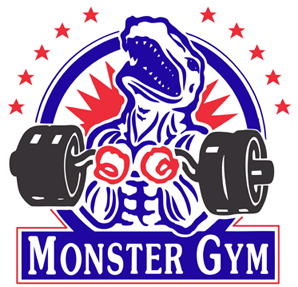 Vicious exchanges in round three saw Duran land devastating body punches which, De Jesus later admitted, hurt him badly and “paralyzed” his legs. The turning point came in round seven, when a five punch combination that ended with a hard right hand, put Esteban on the floor. 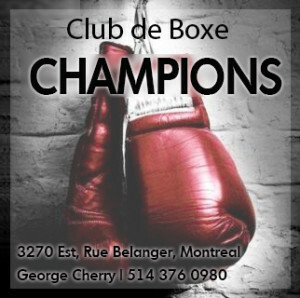 After that De Jesus could be seen arguing in his corner, telling his cornermen he could not continue. Urged on by his handlers he kept answering the bell before he was finally counted out in round 11. Next time took place after De Jesus had won the WBC version of the lightweight crown with a decision win over Guts Ishimatsu in May of 1976. 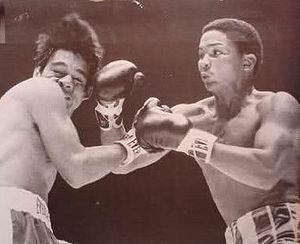 While Ishimatsu had been knocked out by Duran in 1974, the fact remained that De Jesus now boasted both a world title belt and a victory over Roberto. The stage was set for the rubber match, this time on the neutral ground of Las Vegas. This fight would decide, once and for all, who was the true king of the lightweights and who was the better boxer. The battle to decide the real king of the lightweights. By this time, the genuine acrimony between the two Latin-American pugilists had reached the boiling point and preventing them from exchanging blows during press conferences became a major concern for promoter Don King. 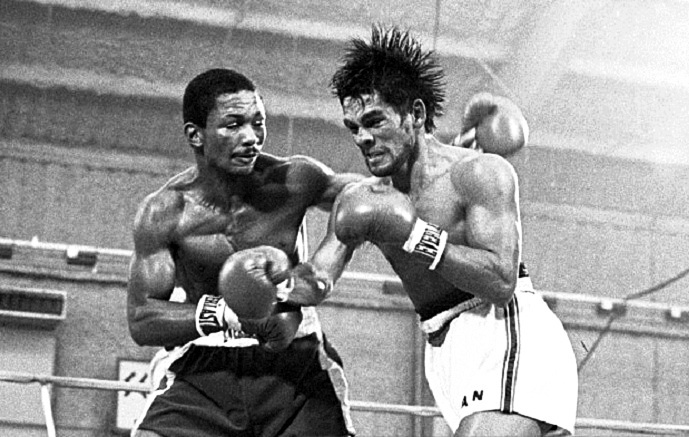 At the weigh-in, the two fighters exchanged insults before De Jesus struck Duran with a right hand, sparking mayhem. 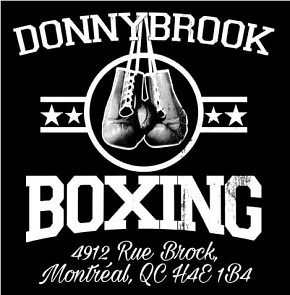 Luckily for all, the boxers were separated and no one was seriously hurt. The pre-fight tension was evident in the minutes before the opening bell. A casual observer at ringside would be forgiven for thinking the psychological advantage was with the Puerto Rican. As De Jesus had his gloves laced on he looked confident and relaxed, smiling and nodding at different people at ringside. In contrast, Duran appeared tense and nervous, his dark eyes darting about and his legs visibly twitching and trembling. But in fact Duran was not nervous, only anxious for the fight to finally begin. The bell rang and this time there was no knockdown in the opening round. Roberto had learned his lesson and he applied constant but careful pressure on his nemesis while using a stiff left jab to control the fight. Aggressive yet patient, Duran seized the initiative, catching De Jesus again and again with the left lead and bloodying the Puerto Rican’s nose before the end of the round. It was the same in rounds two and three: Duran stalking and sticking and in complete control. DeJesus began to show signs of frustration; he could not escape Duran’s pressure and yet he had few chances to counterpunch. Roberto’s body attack took its toll. By round six, all the drama for this long-awaited unification match had vanished. Duran was simply too strong and too powerful and boxing with a level of skill he had never shown before. He masterfully controlled the ring and repeatedly put himself in position to unload his heavy artillery to the Puerto Rican’s midsection, landing a series of brutal body punches. DeJesus tried to turn the tide in round seven, getting on his toes and firing sharp jabs, but Duran calmly picked off most of them with his gloves before driving home more hooks and crosses to Esteban’s belly and ribs. De Jesus is helpless in round 13. It was more of the same in the next three rounds and if DeJesus had any hopes of somehow reversing the momentum they vanished in round ten when he landed his best punch of the fight, a powerful left hook to Duran’s jaw, and the Panamanian didn’t even flinch. Roberto was now simply walking his man down and battering him on the ropes. Round eleven was all Roberto and at its end DeJesus looked like a beaten man. His handlers, knowing he was now hopelessly behind on points, urged him to go for the knockout and in round twelve he saw an opening and moved in to fire one of his powerful left hooks, but this time it was Duran who beat DeJesus to the punch. He drove home a vicious right that floored DeJesus and marked the end of the contest. Great article, The day I saw him against Sugar Ray was the day I found my beloved sport and my boxer of all time.